An afternoon stop in Ilanskaya for coal. My train timetable says we are 4379 km from Moscow, so if I have covered 1502 km getting to Moscow then that’s 5881 km total so far – that is further than I had guessed. As you can see its dry and sunny now, not sure how cold, maybe around -10 degrees C.
Lots of platform food action here – beer, weird dried fish and chilled dumplings – we must be getting more Eastern if the food is anything to go by. The mode of transport for these mobile “shops” is by sledge between the platforms! A chilled out afternoon chatting and reading. 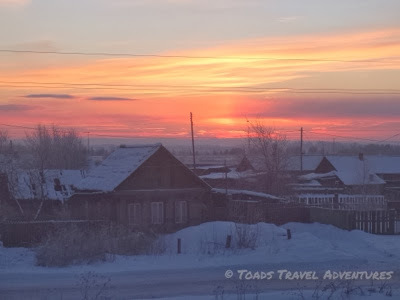 There are a couple of Londoners getting off from our carriage in Irkutsk tonight – that’s about midnight train time, but locally in time for breakfast (with no chance of sleep). Adam (also overlanding to Singapore, but via Laos by bus) suggested that I invest in some hostage insurance for such trips in the future, especially if I am going through Central Asia next time. I have made a note to self – contact a company called “Black Book” on return, assuming I am not taken hostage first. I suspect he has it though as his father happens to be the chairman of a well known multi national company – and does not want to have to pay the ransom money! The sun is now slowly setting in a spectacular fashion, I can’t stop taking snaps of it. My Beijing time zone says it’s not long until beer o’clock, so I will shortly put on my gloves and head torch for the journey backwards four carriages to the restaurant I know as “Little Russia”. 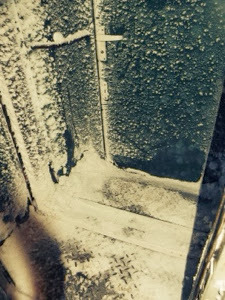 On that subject, getting between carriages is an art that I seem to be getting quite good at – the trick is never to let go of the door handle of the carriage you are leaving until you have the next handle in your hand. Does that sound like a possible ancient Chinese proverb? 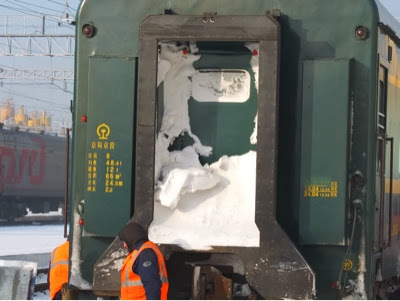 However my technique does not prevent the snow accumulating in my standard Russian train issue Crocs though..